This is FRESH AIR. I'm Terry Gross. The first time I heard my guest Pokey LaFarge sing, it was on the soundtrack of the HBO series "Boardwalk Empire," an album on which contemporary performers do songs from the '20s and '30s, the era the series was set in. LaFarge's version of the Hank Williams classic "Lovesick Blues" caught my ear. POKEY LAFARGE: (Singing) I'm in love. I'm in love with a beautiful gal. That's what's the matter with me. I'm in love. I'm in love with a beautiful gal. She don't care about me. GROSS: Well, after hearing that, I got some of Pokey LaFarge's albums, and I like those too. His albums include a few old songs, but mostly, he does original songs inspired by early blues, country and western swing. Jack White is a fan and produced a Pokey LaFarge recording and had LaFarge open for him on a 2013 tour. I figured I'd invite Pokey LaFarge on our show the next time he had a new album, and that time has just arrived. The new album, his seventh, is called "Something In The Water." He's currently on tour. Last week, when he was in Nashville, he went to a studio so we could record an interview. He also brought his guitar so he could perform a few original songs for us as well as a few old ones that influenced him. But before we hear him perform solo, let's hear him with his band on the new album. This is an example of one of his songs that's rooted in the Midwest, where his family has lived for generations. It's called "Knockin' The Dust Off The Rust Belt Tonight." LAFARGE: (Singing) Well, the lights are on. It's time to go - got to hit the stage for another show - knockin' the dust off the rust belt tonight. I started out all by myself, but I'm lucky now that I've found some help to knock the dust off the rust belt tonight. Have you seen what's happening around here? If you ask most people, they don't care. But now is the time we have to do things right, so we're knockin' the dust off the rust belt tonight. From the C-H-I to the S-T-L, I was born to raise a ruckus and do it well. GROSS: That's Pokey LaFarge from his new album, "Something In The Water." Pokey, welcome to FRESH AIR. It is such a pleasure to have you, and thank you so much for bringing your guitar with you. So the song that you just did, "Knockin' The Dust Off The Rust Belt Tonight" - do you think of yourself as being from the Rust Belt Midwest chapter? GROSS: That's Pokey LaFarge performing for us. And he has a new album which is called "Something In The Water." So your music is so influenced by music of the '20s and '30s. How were you first exposed to that? LAFARGE: Well, it was sort of coming to a fork in the road. And like Yogi Berra says, when you see a fork in the road, take it. I just kept following the signs. I certainly was being exposed to a lot of the same music that any kid would be exposed to at the time there in grade school, junior high, respectively. GROSS: And what was that for you? What were the hits of the time? LAFARGE: You know, the same old - yeah. I mean, this is, like, mid-'90s, so you know, like, Snoop Dogg and Ice Cube and all different kinds of stuff. And I love that stuff, but as I started to really get interested in my own creativity - and I got to hear some early blues around 13 - you know, the real old blues and the acoustic stuff - just a guy and a guitar, you know, seemingly crying with his guitar and the voice and the guitar becoming one - that was the real big - that was the sign. OK. Yeah. This is real music. And so then (imitating gunshot) from there and in all different directions. GROSS: Can you play a few bars of a song like that - an early blues song that really got you going? LAFARGE: I'd love to. And this is a song by a guy from Indianapolis named Leroy Carr which is called "In The Evening." (Singing) In the evening, in the evening, baby, when the sun go down, late in the evening, mama, yes, when the sun go down, he's lonesome. He's so lonesome when your love not around when the sun go down. GROSS: That's great. You've got this kind of trill in your voice sometimes that I really like a lot. And very few people sing that way anymore. And I was wondering if that was something you had to work on or if you found that you naturally had that in your voice. LAFARGE: Yeah, was, like, my favorite soloist of all time. I cry when I hear his playing, sort of like Sean Penn's character in "Sweet And Lowdown," you know, when he hears Django Reinhardt (laughter). LAFARGE: But they had to come up with this vibrato to compensate for the poor quality of the clarinet, you know, just, like, literally warping in the humidity there in New Orleans. And I think - I don't know. Maybe it's the same thing with my voice. I'm compensating for notes that I can't hit cleanly. I'm certainly not a trained singer. I'm just kind of following a feeling. I don't know. LAFARGE: But you know, there's been some great singers even throughout - I mean, throughout the rock 'n' roll era and into now that are singing that way. I mean, I even - I mean, like, even Tom Jones or, like, Morrissey, you know - they throw in this really cool vibrato. They just do it a little tighter, almost more like a, you know, a classical - more classical type way. Yeah, I guess - hopefully, I'm maybe just saying there's more of a difference, but I don't know if vibrato's certainly a thing. Maybe you're saying the trill is more specific. And I think that it is definitely a big part of that - an influence from old singers, for sure. GROSS: So you're a fan of Tom Jones? You like "Delilah?" LAFARGE: Yeah. What? I love that song. LAFARGE: Are you kidding me? If that tune comes on, I will definitely be fist pumping. GROSS: It's so big (laughter). GROSS: It's so desperate (laughter), yes. LAFARGE: I'm a sucker for epic pieces like that. I would. GROSS: Did you sing songs like that? GROSS: I can't - it's, like, hard for me to imagine you doing that. LAFARGE: I mean, I have a - I could play a tune that's sort of epic. I mean, if you listen to it on the record, it's more epic, but I could play a tune - a little bit of a tune that I wrote that's kind of epic. GROSS: Yeah, yeah. Let's go, yeah. LAFARGE: (Singing) Last night, I dreamt you were a glass of Rioja wine we drank on the first night we met. You had to cross my tongue, trace through my veins. You could have gone with me on the morning I left. Oh, la meva maca senorita, you danced the sardana, bare feet on the floor. And when you get tired, lay your head on my chest. Please hear my song. Don't you cry anymore. Oh, my heart is a bird that sings while you're gone the loneliest song that you've ever heard. Goodbye, Barcelona - so glad I've been shown you. I'm going. I'm leaving the land of the sun for the far north where I don't want to go, where the rain, it stops for no one. Yes, but I'm bringing a bottle of rum. GROSS: Really nice - and that's a song called "Goodbye Barcelona" that Pokey LaFarge wrote, and it's featured on his new album which is called Pokey LaFarge, "Something In The Water." And that's Pokey playing in the studio for us. That sounded terrific - really nice song. GROSS: I think this would be a great time to take a short break, and then we'll talk some more and hear more of your music. And my guest is Pokey LaFarge. He has a new album which is called "Something In The Water." So we'll take a short break, then we'll be back. This is FRESH AIR. GROSS: This is FRESH AIR. 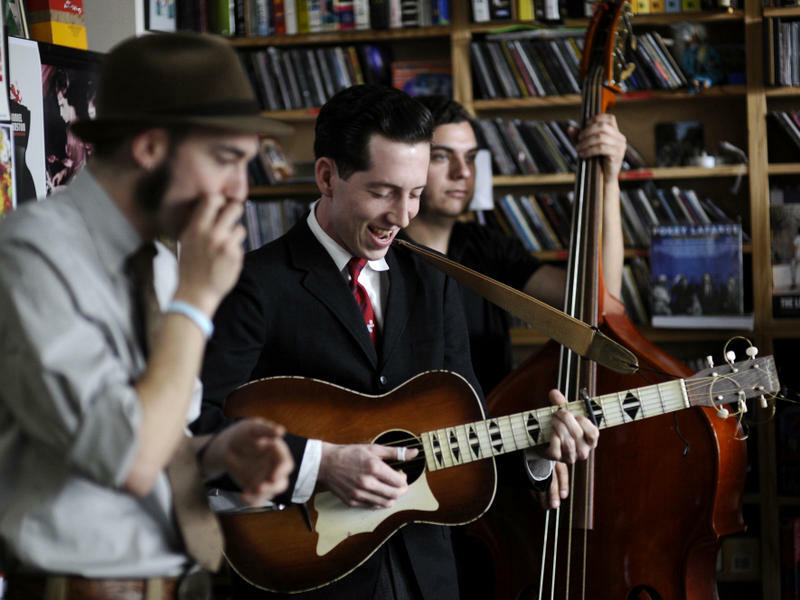 And if you're just joining us, my guest is singer and songwriter Pokey LaFarge. He has a new album called "Something In The Water." So we were talking about how you were influenced by music of the '20s and '30s and probably I'll throw in the '40s in there, too. It's not like you stopped listening to music after that. I mean, (laughter) other periods have influenced you as well. LAFARGE: That would be foolish. GROSS: That would be foolish. But going back to the earlier style, was there - were there people in your family who had that kind of music in their record collection or who played that kind of music? Like, I think you had a grandfather who played banjo in a banjo club in St. Louis? LAFARGE: I did. Yeah, my mom's stepfather, and he's also the guy who bought me my first guitar. He gave me his old banjo from 1900, his tenor. It was a plectrum banjo that he played in said banjo club. But my dad's dad was a sort of an amateur historian, a World War II veteran, was always, you know, playing me Westerns and World War II documentaries. And I think I saw "Glory" when I was, like, 5, and I was like, this is the greatest movie ever. This is so interesting, yada yada (ph). My mom's dad, you know, both of - seems like they were all carpenters and just men's men that could fix anything and - Civil War reenactments and different things like that. So I don't know. It just seemed like history was very present in my family. GROSS: And did you ever get into, like, racial insecurity? Like, I'm a white person, can - is it unauthentic if I sing this material? LAFARGE: Oh, sure, absolutely. But at the same time, you know, I - you know, country, blues, rock 'n' roll, these sort of - these are things that anybody can sing - male, female, person of color. Whatever it may be, from wherever you are in the world, you can sing this. At the same time, it is important to give credit where credit is due and remember that the people that, you know, sometimes, you know, gave their lives for this music. But, you know, there's the blues, but then again, if you wanted to use a genre that's singing the blues - the white man's blues, if you will - that's country music. I mean, that's why I think Jimmie Rodgers was such an important thing for me. Jimmie Rodgers was sort of the bridge to a lot of things. And also, the - he led people down all these different kinds of roads. I mean, he was singing blues. He was singing jazz. He had some of the first, you know, recordings with - of a white guy and a black guy in country music, you know, performing with Louis Armstrong in country music in 1931. So he was the father of country music. And to me, it was like, this is the guy. And before him, there wasn't - you know, there was like before Jimmie Rodgers, and there was after Jimmie Rodgers. And so guys like that, I would always strive - I've always wanted to emulate somebody who was genre-less, someone who invented their own things. And I use that as a big influence. That's my guest, Pokey LaFarge, performing a song by Jimmie Rodgers, who is somebody who influenced Pokey LaFarge. So you've been influenced by a lot of people who sang songs about traveling, about being on the road, about being on trains. I can't remember whether you dropped out of high school or graduated high school first, but then you kind of hitchhiked cross-country. And as much as you feel rooted now in the Midwest and have songs about the Midwest and continue to live in the Midwest, as soon as you could, you took off (laughter). Why did you want to leave so young, so badly? LAFARGE: Well, I probably wouldn't have songs about the Midwest, I wouldn't feel - I guess, the responsibility of being a representative of where I'm from if I had not left and started traveling the day I graduated high school. You know, you have to sometimes get out of that place that you grew up or a bad place in your - maybe it's a relationship or a job or school or whatever it is. Sometimes you just got kind of rip the Band-Aid off and go. And that's something you don't - a long, winding road, literally and figuratively, and ultimately back home with the opportunity to again live in the Midwest - and then all the travel since then. So I've lived back in St. Louis for seven years. With the experiences that I've had around the world as a comparison to where it is that I'm from and where I continue to live, you know, how different things are and really how similar things are, you learn. You learn a lot, and you realize you don't know anything at the same time. GROSS: My guest is Pokey LaFarge. He has a new album called "Something In The Water." After a break, we'll hear him sing more and whistle. A little later, Ken Tucker will review the new album by Alabama Shakes, and linguist Geoff Nunberg will consider how the word disrupt became part of tech and corporate jargon. That's after a short break. I'm Terry Gross, and this is FRESH AIR. GROSS: This is FRESH AIR. I'm Terry Gross, back with singer and songwriter Pokey LaFarge. He has a new album called "Something In The Water." His music is influenced by early blues, country and western swing. He brought his guitar to the studio to perform original songs and some songs that influenced him. We've been talking about some of the people who influenced you and some of the styles that influenced you. And one of those people is Bob Wills, one of the fathers of Western swing - of combining country music and jazz and getting something kind of new out of that. So what impact did it have on you when you first heard his band? LAFARGE: Sort of the same feeling I get - I put that in the same bin as Jimmie Rodgers, you know, to where it was genre-less. I mean, it wasn't called Western swing, I don't think, until the mid-'40s, although they were recording by the early mid-'30s. So again, they're playing just what they would call, you know, hillbilly music or country music and other various things, not Western swing. It's kind of interesting, you know, people like to draw lines in the sand. I prefer to blur those lines, and I think that Western swing does that remarkably. GROSS: There's a Bob Wills song that you play on one of your earlier albums called "The Devil Ain't Lazy." I was wondering if you could do a little bit of that for us. LAFARGE: Sure. I will let the Western swing peers know that I switch this over into a minor key. This was a song written by Fred Rose, you know - wrote some songs for Hank Williams and stuff like that. But yeah, wrote this tune for Bob Wills. Here we go. (Singing) Well, the devil ain't lazy, no siree. The devil ain't lazy, no siree. He likes to see us fight and fuss, makes us mean enough to cuss, then he blames it all on us - man, 24 hours a day. He travels like a lightning streak, and he strikes from town to town. If he gets you when you're weak, he'll tear your playhouse down, down, down. The devil ain't lazy, no siree. The devil ain't lazy, no siree. When you think you're strong and brave, smart enough to not behave, you got one foot in the grave, man, 24 hours a day, 24 hours a day, 24 hours a day. Yes, he works 24 hours a day. GROSS: And that's Pokey LaFarge performing for us a song that Bob Wills recorded, "The Devil Ain't Lazy," that Pokey does on an earlier album. His new album is called "Something In The Water." Did the devil mean much to you when you were growing up? Did you come from a church family? LAFARGE: He's the guy you see on Halloween. He's not the guy you see on a daily basis. You know, I think I've probably seen the devil in things more literally these days or as I've gotten older. But, you know, I think a good amount of the devil in your life is healthy. GROSS: I'd like you to do another song for us, and this is a song that you wrote and you perform on your new album "Something In The Water." It's called "I Wanna Be Your Man." Maybe you could tell us a little bit about writing this? LAFARGE: Well, "Wanna Be Your Man" is one of those tunes where you just kind of write it, and it happens. Boom, it's done, you know? Other songs, you write bits and pieces of, and you're kind of wondering where the song can go, wondering where the hook is at. But with this one, you know, in respects to even the first verse - something's wrong honey, this I know. Never seen me this way before. Hey baby, I wanna be your man. And even right then, I was like wanna be your man, that's the hook. So just wrote it from there and even automatically the tempo - (imitating tempo) - just like that. And I was like, man, that will sound real good with a tuba. And if you listen to the record, you'll hear it with a tuba - and first song I've ever recorded with a tuba. It just worked out. So let's see if we can do this here - "Wanna Be Your Man." GROSS: Yeah. I like that. And I like it with the tuba, too. I like it with the full band. In fact, let's hear a chorus of the song with your whole band from your new album "Something In The Water." GROSS: That's Pokey LaFarge from his new album "Something In The Water." Tell us a little about your upbringing and your family and your neighborhood. LAFARGE: Well, you know, I moved around a lot before I graduated - even before I graduated high school. I would actually say that that probably has something to do with why I'm comfortable with traveling so much even now and maybe even why I had no problem leaving everything behind. I grew up playing baseball. That was my thing - baseball. I wanted to be a professional baseball player. That didn't work out. I think my dad even told me - he's like, you're not going to be a professional baseball player. I remember being really mad at him for saying that, but I'm glad he told me that. It was pretty real. GROSS: Well, did he also tell you you weren't going to be a professional musician? LAFARGE: (Laughter) He didn't tell me that. I think he just kind of was trying to steer me away from that. But, yeah, he's my biggest supporter - my whole family, my mom, you know, step mom, grandparents. They're all, yeah, biggest supporters now. GROSS: Did you learn - have to learn how to be uninhibited onstage? LAFARGE: Oh, yeah, of course. Yeah, especially since I had no - I mean, I was always sort of a ham. I talk a lot. I'm wild. I was always performing growing up, but not on stage. Nothing has come easy for me. It's taken a lot of hard work, a lot of experimentation, a lot of kind of looking inside yourself and saying, hey, man, you know, man up. You know, you've got to leave it all on stage. And I think I finally got to the point where I am confident to just leave it all on stage like I have nothing to lose, and it's been good. I think we're actually, I think, playing the best shows that we've ever played now, finally (laughter). GROSS: So there's something else about your performing style I want to ask about, and that is that you whistle. GROSS: There are some great recordings from the 1920s with this great, like, warbly - warbling whistling on it. LAFARGE: Oh, yeah. Yeah, so good. GROSS: That's Pokey LaFarge, and that's actually a song that he also does on his new album which is called "Something In The Water." And that's an old song, I think, from the 1930s. It's actually from a 1936 movie. And the movie had like Tony Martin, Alice Faye, the Ritz Brothers, Patsy Kelly, who was in a lot of Gene Autry movies. GROSS: ..."On The Good Ship Lollipop" for the Shirley Temple movie. GROSS: "Ain't We Got Fun," "Hooray For Hollywood," "My Ideal." And it's such a great example of the kind of cross-pollination in American music. Like, how do you know that song - probably not from the movie. LAFARGE: It was from Big Bill Broonzy. LAFARGE: Yeah, but also there's a great singer - actually, I first heard it from Thomas Fraser who's this crazy multi-instrumentalist from the Shetland Islands of Scotland who first heard country music when USO Radio was being broadcast and you could pick up the waves over the Atlantic. I recommend anybody checking him out. You want to talk about a yodel and a whistle? This guy is insane. But I'm a sucker for a good melody, a sweet sort of melancholic tune, like I did in that "Let's Get Lost." And that - I think I write - writing songs from that vein - it definitely has roots in the past, but I mean - you know, you hear that in today's music in different ways, perhaps not so attached to earlier stuff. But, you know, the Beatles were a good representation of that. I think the Beatles really - they could write songs that were sweet and melancholic but definitely rooted in sort of that Tin Pan Alley and early pop tunes. LAFARGE: It's been an honor. Great talking with you, take care. 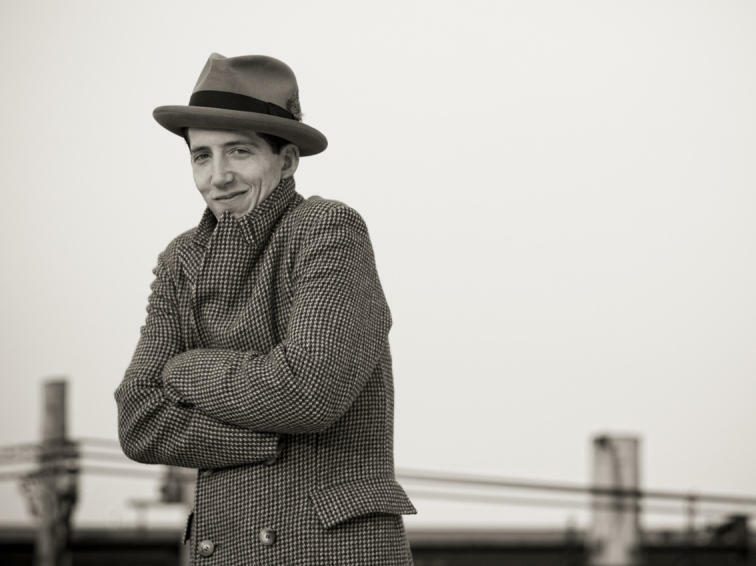 GROSS: Pokey LaFarge has a new album called "Something In The Water." After we take a short break, Ken Tucker will review the album - the new album by Alabama Shakes. This is FRESH AIR. Transcript provided by NPR, Copyright NPR. 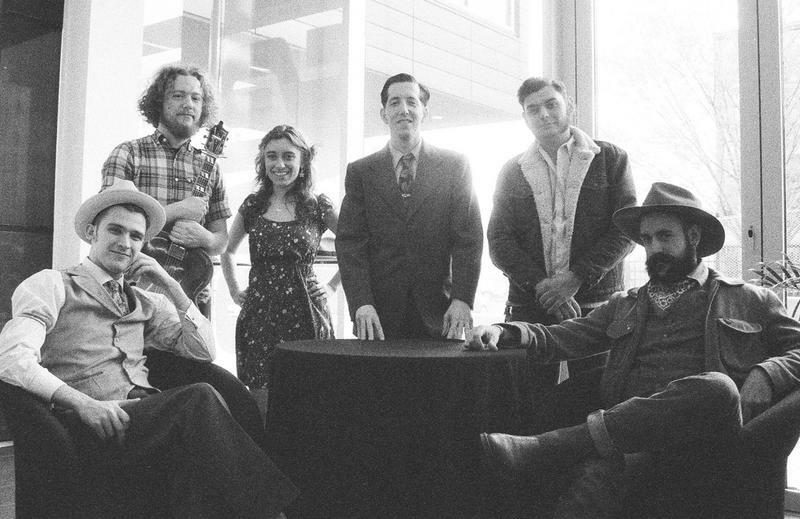 Miss Pokey LaFarge on A Prairie Home Companion this weekend? Here's a video slice of the band's performance of "Central Time" on the show. "Being from St. Louis, Mo., being from the Midwest, we realize we're supposed to be humble...'Yeah, I'm from the Midwest,'" LaFarge told the crowd. "But I go around the world and say, 'Yeah, I'm from the Midwest!'" Want more Pokey? Check out our past coverage of the band.